Mascots raced each other around the bases and then posed for group photos with fans. A sudden sun shower drenched a long line of kids waiting to climb into a bounce house. A group called “Bucket Ruckus” banged on buckets throughout the ballpark. One brave soul named Tyler Scheuer, who aptly dubbed his performance “Tyler’s Amazing Balancing Act,” split his time between the field and the stands, balancing on his chin everything from cups of beer to a ladder. But it took until the ninth inning Wednesday night for things to get really weird at the Atlantic League All-Star Game. A game-winning RBI single down the third base line by Alfredo Rodriguez lifted the Liberty Division to a 4-3 win over the Freedom Division at Bethpage Ballpark in Central Islip, NY and brought a traditional end to an All-Star Game that flirted, by design and quite happily, with chaos and irreverence. 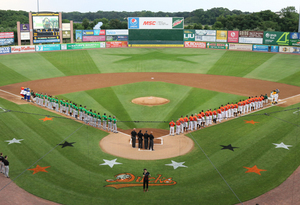 The Atlantic League, which is unaffiliated with Major League Baseball, relishes the opportunity to serve as a test tube of sorts for changes that might someday be implemented at the higher levels. The Atlantic League splits its season into two halves and has as many as two wild card teams and has always featured the constant in-game entertainment that is now a staple at big league ballparks. And long before Major League Baseball commissioner Rob Manfred began prattling on about pace of game, the Atlantic League implemented a 12-second pitch clock, restricted how often batters could step out of the box and reduced the time between innings to two minutes and five seconds. And if Major League Baseball can only find one market the next time it wants to expand? The Atlantic League has a solution for that too, with the Road Warriors, a team whose nickname sums up its existence. The Road Warriors are put together by the league and spend the season playing in everyone else’s ballpark whenever there is an odd number of teams, which happened this year when the Bridgeport, Conn. franchise folded one year before the league expanded to High Point, N.C. In six seasons as the fill-in team, the Road Warriors are a 1962 Mets-esque 185-507. But on Wednesday, for the only time this season, the four Road Warriors — Gustavo Pierre, Isaac Wenrich, Luis Cruz and Andrew Johnston — named to the Liberty Division All-Star team got to play for the home team. Both Pierre and Wenrich stepped to the plate as the potential winning run earlier in the ninth inning. The Atlantic League was an out away Wednesday from another test case. Had Rodriguez been retired for the third out of the ninth, the All-Star Game would have been decided by a “homer-off” in which each manager would have pitched to one of his players. Whomever had the most homers in a three-out span would have won the game for his team. As it turned out, nobody on the bench was entirely sure what would have happened if Rodriguez made the third out. Winning pitcher Evan Scribner, who struck out the side in the ninth and led the charge out of the dugout to mob Rodriguez, said he wouldn’t have been disappointed if the game went to Home Run Derby. The uncertainty of the ninth inning created some interesting moments in the press box, where Pfaff stood next to Atlantic League president Rick White and played traffic cop as all the contingency plans were debated. White stood with the MVP trophy, meaning an MVP had to be determined if the Liberty Division won. The in-game host had to be ready to head to one of the dugouts to entertain fans if time had to be spent preparing for the “homer-off” (batting practice screens would have been wheeled to the pitcher’s mound) and ready to bolt to the field if the game ended in nine innings. And the crew in charge of setting off the post-game fireworks behind the centerfield fence needed to know when it had to begin setting up shop. The game-winning hit by Rodriguez solved everything — he reached base in all four plate appearances and was the easy MVP choice — and began the day’s final flurry, a 15-minute span in which the Liberty Division celebrated, Rodriguez was presented his award and players from both teams sprawled out on the field and watched as a boisterous fireworks display was set off in the distance. Pfaff laughed when asked which ending he preferred, but the routine walk-off served as a reminder that for all the built-in chaos, the Atlantic League is, in the end, about baseball players trying to win games and trying to get back to where they want to be. The Atlantic League has sent more than 1,000 players to a major league organization, more than 100 of whom have made it all the way (or all the way back) to the majors. Among the more than 6,000 people in attendance Wednesday were several scouts, all armed with laptops and radar guns, sitting behind home plate and hoping to unearth a gem in between mascot races and Tyler’s Amazing Balancing Act.